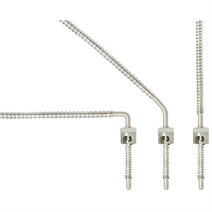 The TC47-FB fixed bayonet thermocouple is a general purpose temperature sensor designed to suit all applications where metal sheathed thermocouples are required. An extensive range of elements and process connections can be individually selected for the appropriate application. With the flexibility of assorted diameters and pre-determined immersion lengths, the model TC47-FB thermocouple can be used in a wide variety of easily accessible location. The fixed bayonet cap allows the sensor to have a positive pressure at the tip when installed correctly. The fixed bayonet, tube and wire design is held in place with a bayonet adapter. They are especially suited for applications where the metal sensor tip is fitted directly into a drilled hole.